ITSM focusing on the ‘business’. That’s Gensys IT Service Management. See at a glance the impact of a disruption or threatened disruption on the business. Gensys Service Management supports the ITIL processes. Gensys is also a workflow solution, with which the quality of your service management is guaranteed. 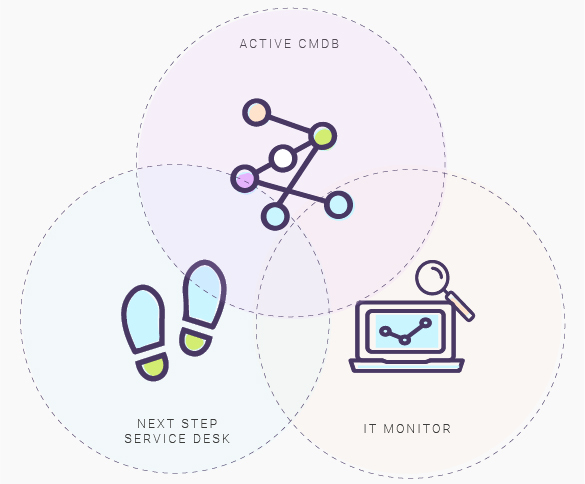 Gensys contains an extensive Service Desk and SPS is the only one setting the ‘next step’: you and your client or end user see not just what has happened, but what is going to happen! So everyone involved is fully up to speed and can thus anticipate effectively. What were the actions, and what will the actions be? Also for cooperative use. Knowledge base. Optimal business-IT alignment. Manage IT from a business perspective. For a guarantee of quality. Control the management processes. Adjusting for workload becomes even easier. SLAs and contract forms per ‘client’. Controlled by SLA. 24×7 and standby. Synergy through integration with Active CMDB and Monitor. 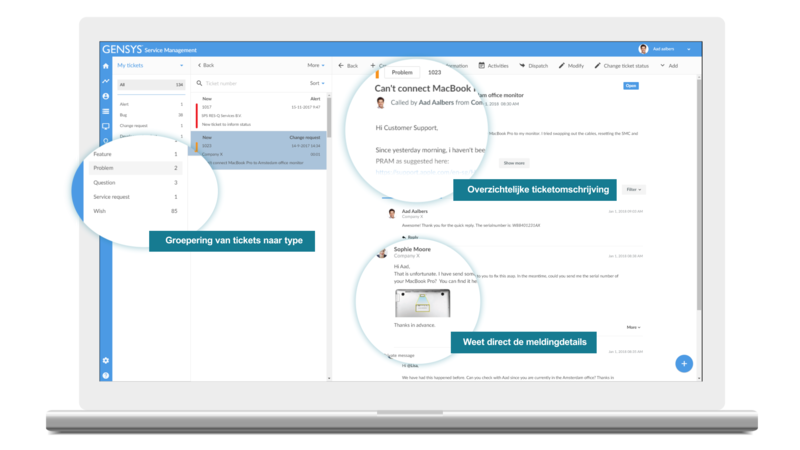 REST APIs for Skype for Business, AFAS, TOPdesk and more. Cost allocation at multiple levels. Pay for use. Differentiated tariffs. Extensive set of reports available. Also create reports yourself. Multiple dashboards. Manage from any device irrespective of time or place. Complete Service Desk. See in one timeline what the activities were, and what the result was. But also see what’s going to happen. Anticipate effectively because everyone is up to speed on all the communications and proposed actions. Resolve queries and problems quickly with the Gensys knowledge bank. 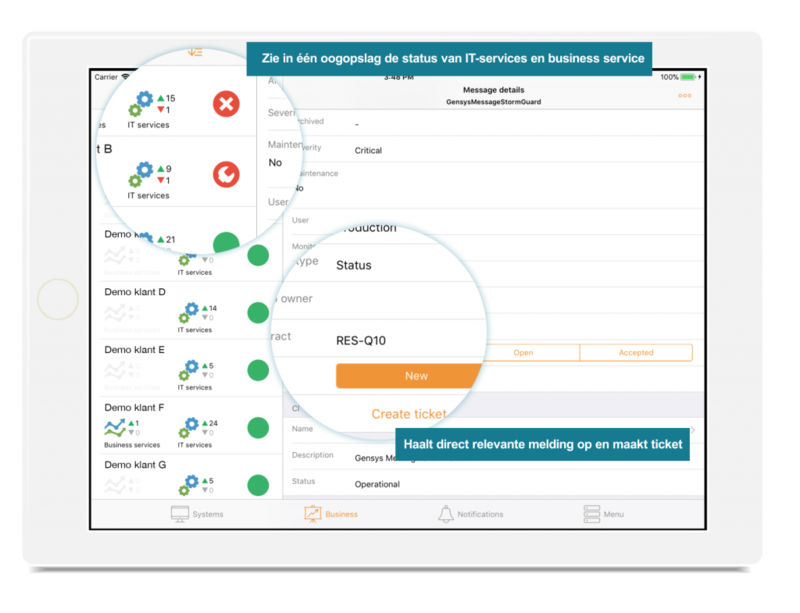 Fulfil the service desk as a service provider together with your client? It’s possible. IT service management must ensure the uninterrupted operation of the business processes. That’s why Gensys focuses on the business impact. Monitor the digital processes and solve problems in the underlying IT quickly. In a (emerging) disruption, see at a glance which business service, which business process, will be affected. The statuses of the business services are shown in real time, also per geographical location. Not only by showing ‘good’ or ‘bad’, no in fact even a threatened disruption is visible. Monitor the correct and timely progress of the management processes and guarantee the quality of your IT service management. That’s possible with Gensys, because management activities can be guided by rules and structure. In fact, Gensys is a workflow solution. 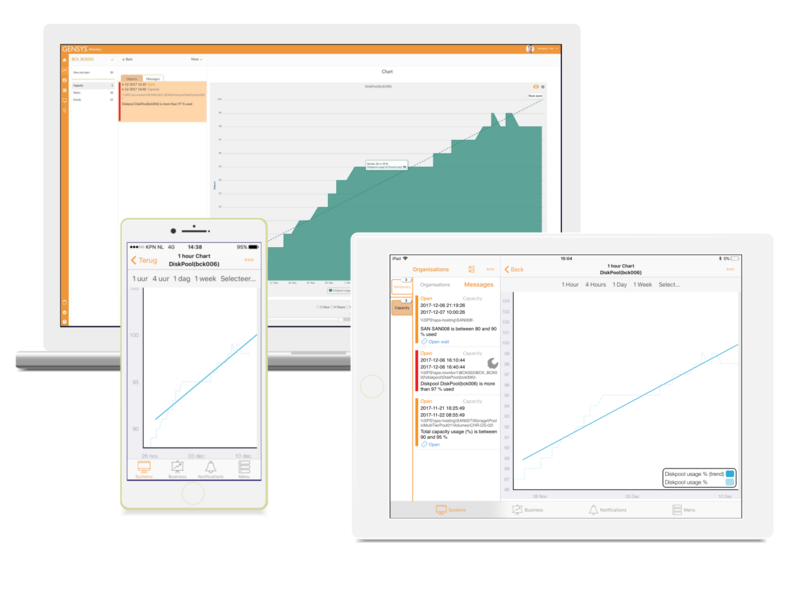 Make IT management plannable and manageable among others through insight into the current workload, the plannable space and recording repetitive tasks in the ‘event calendar’. Monitor the performance of your IT infrastructure and that of your service management, through SLAs. Multiple contract types. Multiple contracts per client. Multiple contracts on the IT infrastructure (of a client). Per contact, multiple activity types and tariffs. This enormous flexibility remains manageable. Ensure optimum employee and customer satisfaction through the 24/7 standby functionality of Gensys. Make IT management more effective, gain more ‘power’ through the integration of Service Management, Monitoring and Active CMDB. For many organisations Gensys is the central system. It contains all the data and processes which the primary processes of a IT management organisation needs. Connectors to adjoining systems are sometimes needed, e.g. the administrative system or the central time-tracking administration. Easily link solutions from third parties with the extensive set of REST APIs. Bill your services based on fixed pricing agreements or what has actually been used. Hour usage is automatically recorded and billed in accordance with specific client agreements. Calculate the ‘service cost’ exactly and allocate costs at multiple levels. Gensys has a unique hours and invoicing system, particularly for service providers. Even more insight through a huge volume of reports. For instance about IT assets and other CMDB information, monitoring and trends, service desk performance, SLAs and KPIs, billing and financial performance indicators, hours usage and projects, service management, security audits, personal and team KPIs and more. It’s possible to create reports yourself, and every report for a department or end-client has a tailor-made layout (layout, colours, logos). 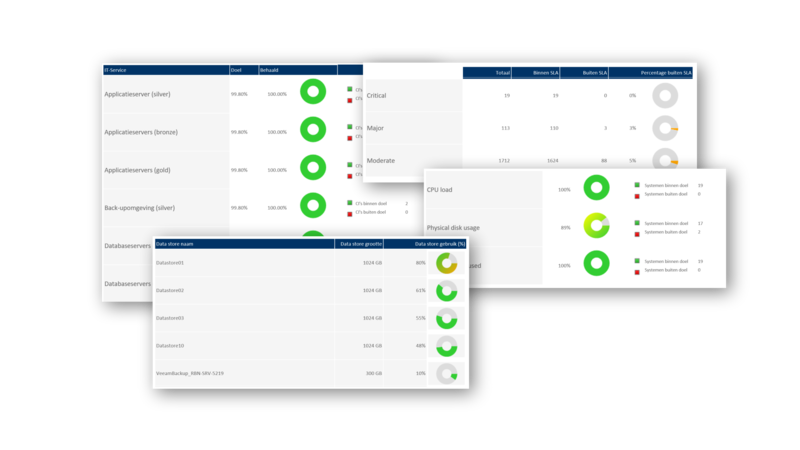 You can see what’s happening at a glance and what the status is of the significant characteristics of the management processes, with the Gensys Dashboard. Be effective and productive, everywhere and always. Manage from any device irrespective of time or place. 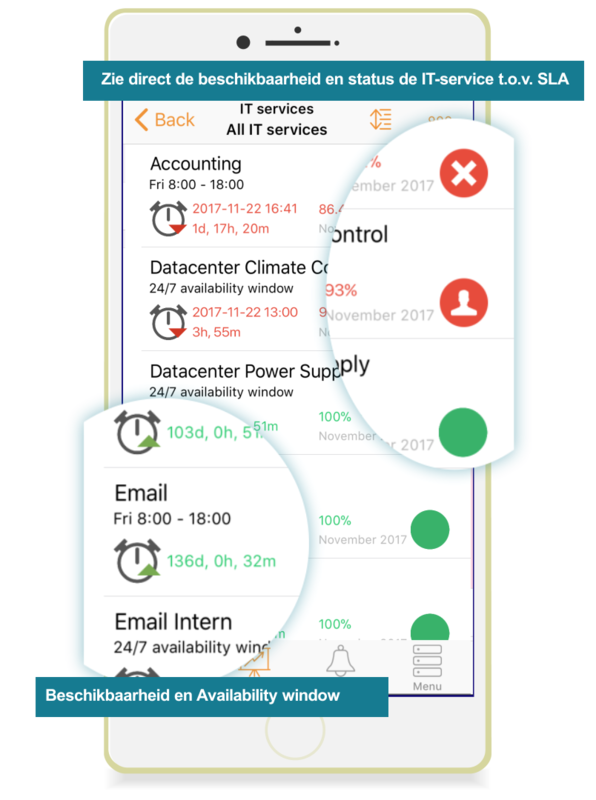 Improve the effectiveness and productivity of your IT management organisation, because at any desired time, in any place and from any device, insight is available into your IT infrastructure and/or that of your clients. Respond quickly and satisfactorily. Work efficiently with the available time of your managers and service managers.